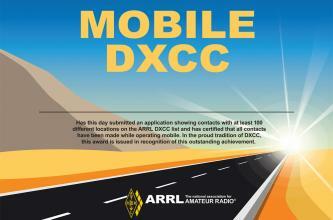 This award is available to amateurs who have contacted at least 100 DXCC entities while operating mobile. Contacts made any time in the past count and no QSLs are required. The Mobile DXCC is a one-time award and is non-endorsable. You do not have to be an ARRL member to qualify. This award is available to amateurs who have contacted at least 100 DXCC entities from a vehicle, capable of moving itself, using only power and antennas that may also be moved with the vehicle (read the definition of the mobile station and mobile operation below). Contacts made any time in the past count and proof of contact (QSL cards or LoTW) is required, but do not need to be submitted with your application. ARRL may ask for proof of contact if there are any questions about the claimed QSO. The MOBILE DXCC is a one-time award and is non-endorsable. You do not have to be an ARRL member to qualify. Please note that it is not required to be in motion while operating. Distracted driving is a serious concern. Exercise care when operating and obey all laws. For this award. Mobile stations may use any legal power for the entity wherein they are located. This award specifically excludes QSOs made by aeronautical or maritime mobile stations. ARRL, 225 Main Street, Newington, CT 06111.